Not exactly ON the Eno River, but it adjoins the confluence of the Flat and Eno Rivers just before it flows into the Falls Lake, which is also the beginning of the Neuse River. 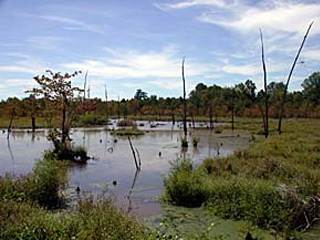 These lands are water impoundment areas and are popular with bird watching enthusiasts as well for waterfowl nesting. It is used by hunters during hunting seasons. You should be very aware of hunting seasons and waterfowl nesting seasons (Spring-early Summer) or only walk these trails on Sundays when no hunting is permitted. You ARE permitted to walk these area during hunting season, but you should wear bright orange clothing of some sort for safety reasons. There is one 'Disabled Sportsman Access' trail that leads to the beaverpond. Park in the middle of three parking areas and head west. I have yet to walk this trail and will report on its condition at a later date. 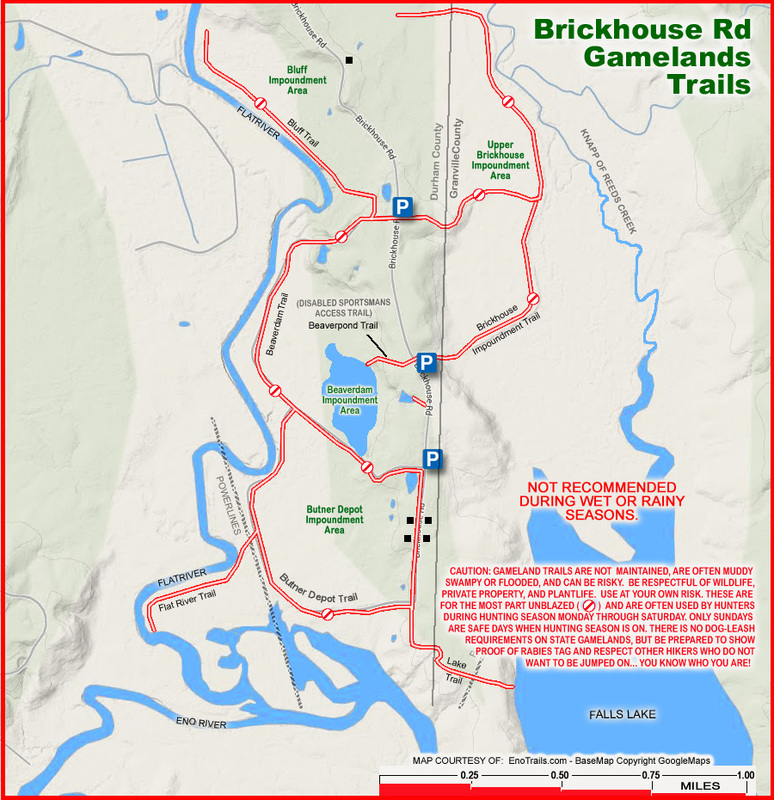 You should use common sense walking these trails after a heavy rain - this area is designated for water impoundment so Falls lake does not flood periodically, so they can often be wet and muddy. Access the area off Old Oxford Road almost to Granville County and turn south on Brickhouse Road. The three parking areas designated on the map are gravel and dirt and can hold multiple vehicles easily. Brickhouse Road dead-ends at the bottom parking area and continues as a trail/access road. NOTES: There are no trail names marked - they are my names for this map only. 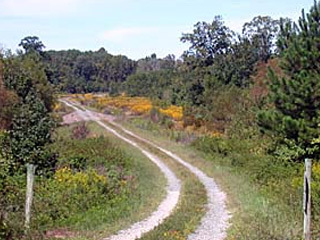 I will develop better individual trail descriptions as I complete the walking of these trails. Use caution during Hunting Seasons, Check NCWildlife.org for specific dates, but generally; Turkey season, April and early May; Deer and Fox, late October - Jan 1; Other Small Game, Jan & Feb. RIGHT CLICK & "VIEW IMAGE" or "OPEN IN NEW TAB" TO DISPLAY FOR PRINTING JUST THIS MAP.